I don’t know all of the characters equally. You, the reader, won’t either, because secondary or minor characters don’t get as much stage time as the two falling in love. But that doesn’t mean they aren’t creating their own stories in a place I haven’t tapped completely yet. What better time to tap the strange and magical world of story characters then October, when things come alive! 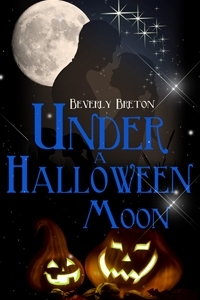 Two of the characters readers have said they especially enjoyed are Livvy and Mindy, the five-year-old girls in my story Under a Halloween Moon. Livvy is the bolder of the two. She wiggles with glee when she can shock the adults but stay within bounds that don’t get her in trouble. You’ll discover that pretty quickly when she renames one of her teachers. Mindy is an accomplished observer, which makes her an skilled trickster. She giggles with glee when she can get a rise, and a laugh, out of those around her by pushing the envelope, but staying just within the limit. And what better time than Halloween to pull a trick! Livvy’s single father Cam dedicates long hours to growing his architecture business to take care of his daughter. Mindy’s single mother is dedicated to her daughter and her job managing customer service for a local business that enables her to take care of her daughter. When the story opens, Livvy and Mindy, new friends in kindergarten, have not considered the possibility of their parents getting together. Annika and Cam haven’t even met yet. But when a windy overcast Halloween parade meeting blossoms into a trick-or-treat evening under a Halloween moon, everyone is considering Annika and Cam together. What specifically are Livvy and Mindy, our two potential matchmakers, thinking about this development that I didn’t show you in the story? We could be sisters!